This recipe of Easy Paleo Torte is very easy to prepare and it’s perfect for lunch, dinner or even a snack. The dough is so versatile you can use in other recipes. You can also get creative with the filling, using ground beef, turkey, chicken, or make it vegetarian! All you need is your creativity and a food processor. Packed with protein, Omega 3’s and DHA, this recipe is delicious, nutritious and very gentle for the delicate belly! I make sure to buy low mercury, sustainable – Pole & Troll Caught tuna to make this recipe even more nutritious and gentle on the environment as well. What I love about this recipe is that you can reinvent it many different ways! Feel free to get creative with the filling. You can add shredded chicken and a veggie medley, for example. Enjoy! 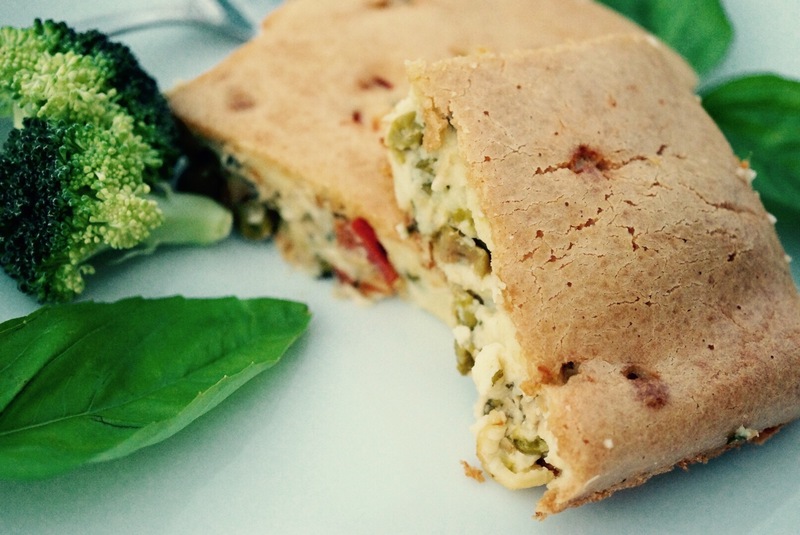 Check out my Brazilian Chicken Pie to make delicious homemade Grain-Free all purpose flour. I also make my grain-free baking powder from scratch. It's very easy and it will last you a little while (complements from the wholenewmom.com blog). Combine all ingredients well and store in a air-tight container. For Tuna filling - Mix all ingredients, combine well and reserve. In a medium pan: onions in olive oil until translucent. Add heart of palm, carrots, peas, salt and oregano and combine well. Add olives and arrowroot starch slowly. Turn off heat and add cilantro. In a food processor add wet ingredients followed by Grain-free all purpose flour and baking powder. Process for 30 seconds or until ingredients are well-combine. The dough should be slightly runny. Grease a 9x13 stainless steel pan with ghee. You can also use coconut oil or fat of your preference. Coat the bottom of the pan with a thin layer of dough. Add a layer with all the filling and top with a final layer of the remaining dough. Bake for 45 minutes and check if it's ready by sticking a toothpick in the middle. If it comes out clean, it's ready to serve!